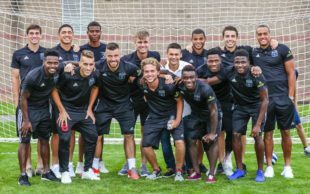 2018 brought the first playoff win in Bethlehem Steel’s brief USL Championship existence, an impressive feat given their roster littered with inexperienced players and first-time professionals. 2019 will bring new challenges and a new look for Bethlehem as they move out of the Lehigh Valley and into Chester’s Talen Energy Stadium. With recently acquired Sporting Director Ernst Tanner looking to instill a tactical change in the Union setup, Steel head coach Brendan Burke and his Bethlehem team will be forced to adapt to the times as well. The run-and-gun/high pressure approach of the 4-2-3-1 system to exploit the overwhelming pace and, at times, creativeness of the team’s youthful wingers are a thing of the past. Tanner looks to bring a 4-4-2 diamond shape to his teams in 2019, which, for Steel FC, means a new core of players to look out for in the new season: “We are not using wingers anymore. We are calling a full back on the offensive side a wing back and on the defensive side an outside back,” said Faust of the new formation. So who are the players watch for in the new-look Bethlehem Steel team and which players have the best chance at breaking into the Union roster this year? In 2018 we saw our first glimpse of what kind of talent the 18 year old Congolese winger is. Acquired in April of last year, Ngalina quickly showed the league why Bethlehem were so eager to sign him after his 18th birthday. He has the pace, he has the willingness to take on defenders, and he has the signature celebration– now, Steel FC fans will wait to see if he has the final product as he takes on a new role in the squad. Now that wingers have been expelled from the two teams, those players are now forced to take on a new role as outside midfielders. Ngalina will have to drop deeper on the pitch and share defensive responsibilities with his fullback. The teenager from Kinshasa proved that he can be a handful for defenders in the USL Championship, scoring seven goals and producing two assists in 24 appearances last season, while also making appearances for the Union in the U.S. Open Cup and mid-season friendly. How he is able to adapt to his new role in the formation remains to be seen, but his goal for the first team in their preseason victory over Orlando City SC is a promising start to the new year. Last season looked to be the year of Union Academy fullback Matt Real. He earned a spot in the MLS Homegrown Game in Atlanta while all of the cards fell into place for the U.S. Men’s U-20 player to break into the first team’s starting 11 when Fabinho went down with an injury early last season. His time in the Union lineup was shortlived, however, as a few costly mistakes against Orlando City in a mid-April contest spelled the beginning and the end for Real–leaving fans to wonder: when will he be ready? Well, there is not much more time left to wonder as the desire for Real to develop into an MLS-ready player has now become a necessity. The decline of the aging Fabinho and Raymond Gaddis could open the door to allow Real to join his fellow Union Academy players Auston Trusty and Mark McKenzie on the back line. As a staple in Brendan Burke’s lineup in 2018, you would fully expect the 19-year-old to continue to see action in league play this year for Bethlehem, but we may be able to expect him to once again make his way into the first team and show the potential Steel FC and Union fans alike know that he has. The newest of signings for Bethlehem Steel, centerback Ben Ofeimu signed his first professional contract on January 24. Like Real, Ofeimu is a product of the Union academy who, in light of signing his new professional deal, will commit to playing full time with Steel FC over playing collegiate ball at Penn State where he verbally committed in May. Also similar to Real, there is a need for Ofeimu in the Union organization. Philadelphia currently has just three youthful central defenders and one aging Aurelien Colin signed to the roster and signing the 18 year old creates a little more depth at the position. With 12 USL Championship appearances, including two playoff starts and a goal under his belt, Ben Ofeimu brings more to the table than most high schoolers. The 6’3″ centerback has the size and pace to match up with any USL attacker and should make for an easy call-up to Jim Curtin’s bench in the case of Trusty, McKenzie, Colin, or Elliott missing time for the Union. I loved Real in preseason last year, but he definitely got the jitters in those first games and played very conservatively. I was looking forward to seeing more of him this year, but it will be interesting to see if he can fill the roll that Tanner has for the LB. If only we could, you know, watch them in BETHLEHEM. Oh come now, opposing team travel fans will never know the difference between Chester and Bethlehem. Besides Philadelphia Union play in Chester. And most New York teams play in Jersey.